I was so relaxed that I forgot it was Thursday! How does that even happen?? I had every intent of posting last night after I made this delicious yellow curry. Guess I was too relaxed from my fabulous massage yesterday. These things happen. Guess what! I didn't post until This Very Minute. So today, a little late, I bring you Thai Yellow Curry & Friday Potluck. You may or may not know that I have a love affair with Thai food. Particularly green curry. I've never had much success though with replicating the dishes. I wish I could tell you where I picked up a delightful little can of yellow curry paste. It's a mystery to me, and I plan to take photographic evidence with me to our specialty grocery store in the hopes that I bought it there rather than at Whole Foods when we lived in the Lower 48. As I work on eating clean, Thai food is particularly wonderful to me -- no dairy, no processed foods (except for the curry paste if you buy it and don't make your own), and lots of whole real food ingredients. Ever since last fall when Full Circle Farms gave me several weeks of their produce boxes to try, I've been hooked on their small Seed size box, and look forward to it's delivery to my door step every Wednesday evening. Whole real foods that are organic and GMO-free have become increasingly important to me. Full Circle has brought me a plethora of potatoes. (I plan to make a spinach frittata with them tomorrow). With potato supplies burgeoning out of my pantry, it was time to make a curry that made use of some of them, and I just happened to find this yellow curry in my cupboard as well. A match made in heaven... after scouring the internet for some fabulous ideas. In the end, my yellow curry was a roaring success! Heat peanut oil in a large pan and add curry paste to it. Cook until the paste starts to toast and smell delightful. Add in the coconut cream and cook for a few minutes, until the colors start to separate. Then toss in the chicken and the coconut milk... and simmer for about 15 minutes before adding the potatoes and simmering for another 15 minutes or until soft. Finally add in the onion and cook until softened. Enjoy!! 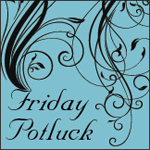 With that, I bring you Friday Potluck!